His Holiness, the 14th Dalai Lama, is both the head of state and the spiritual leader of the people and country of Tibet. Forced from his home in Lhasa, Tibet, after the Chinese invasion in 1959, Tenzin Gyatso – as he was known at birth – now lives in the mountain town of McLeod Ganj, India. 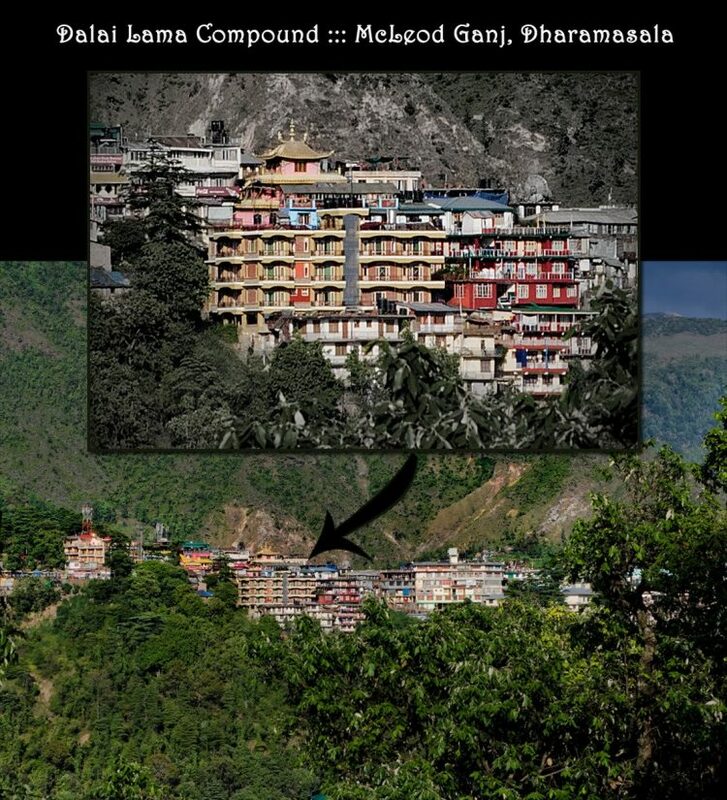 Geographically, the Dalai Lama Complex is located on Temple Road in the Southern part of McLeod Ganj and is accessible by foot, bus, taxi or tuk tuk. The entire Dalai Lama Complex sits on a mountainside with sweeping panoramic views of Dharamasala, McLeod Ganj and the Himalayas. The Dalai Lama Complex/Compound is a surprisingly modest complex filled with open spaces, temples, meeting rooms, monks’ quarters, artwork, prayer wheels, flags and statues. After passing through a metal detector and bag inspection, the entire grounds are open to all visitors: with the exception of the Monks’ dorms. The compound also is home to the Central Tibetan Administration, which is a fully-functioning Tibetan Government in exile. Just outside, a somber memorial and museum inform visitors of the atrocities committed by the Chinese in Tibet. It’s quite appalling and frustrating to learn how little has changed since 1959. Upstairs, several meeting rooms were roped off for entry, but could be peered into from the outside. The most ornate can be seen in the first photo below, complete with a gilded chair that His Holiness the Dalai Lama sits on when he is around. If you’re lucky, your visit might coincide with monks designing beautiful sand mandalas, lighting candles or chanting mantras. The Tsuglagkhang (aka Tsuglag Khang) Buddhist temple is holiest part of the entire Dalai Lama Compound. Located on the second floor, it also is by far the most beautiful room in the complex. Outside, a perimeter of Tibetan prayer wheels are in a constant state of movement as visitors do a loop trying to spin each on as fast as possible for maximum luck. Inside, the walls are covered with intricate murals depicting Buddhist history and religious stories, while statues of Shakyamuni (Buddha of the past), Padmasambhava the propagator of Buddhism in Tibet, and Avalokiteshvara (the compassionate one) stand tall around them. All the images are in a posture of meditation with offerings of fruits, incense sticks, and prayer flags in front. Shoes are not permitted in the temple. Neither is talking or photography of any kind. My biggest issue with the Dalai Lama compound…too many rooms I wasn’t allowed to go into!!! Doesn’t His Holiness know I want to take photographs of everything??? By far the most interesting – and strangest – part of my visit to the Dalai Lama Temple was watching a lively Monk debate. Imagine going in for an arms-out bear hug, but instead of wrapping your arms around the person you clap your hands in his face. That, or a slapping contest where no one makes contact. 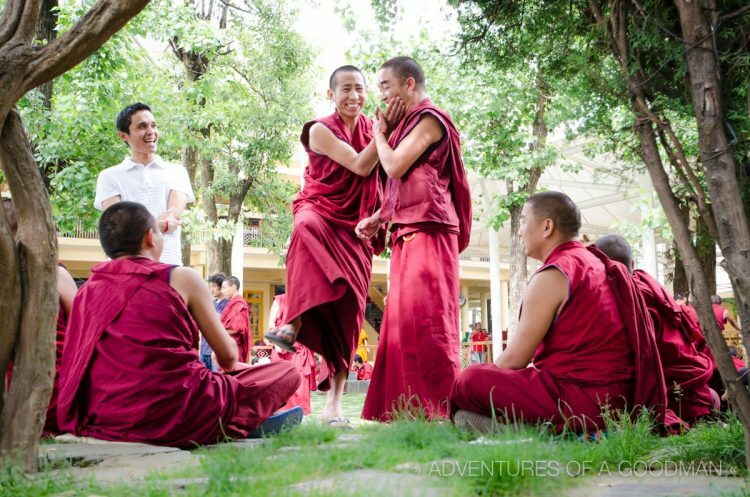 With their red robes swaying and huge smiles that can’t be mistaken for aggression, this daily monk training session echoes throughout the open courtyard and into the streets surrounding the Dalai Lama Complex. In fact, it was the sound of clapping blocks away that drew Carrie, Lauren and I back into Tsuglagkhang, weeks after our first debate-free visit. Said to help expand the mind, this integral part of a Tibetan monk’s training looks like a slapping contest where no one makes contact. The debates follow a strict form, with the standing questioner challenging the thesis of the humbly sitting defender. As the questioner raises doubts, the exchange becomes increasingly animated, with exaggerated body language, lunging, hand slapping and loud shouting. The defender mostly sits quietly and looks away, occasionally making a counter point by waving his arm. It is said to expand the mind, increase mental sharpness, develop analytical skills and help gain mental clarity. Where Was the His Holiness, the Dalai Lama? Sadly, the Dalai Lama switched geographical locations with me, Carrie and Lauren. While we were wandering around his home in India, he was speaking to sold out crowds in California. Fortunately, I already had the incredible experience of being in his presence when the Dalai Lama gave a speech at my college in Washington, DC. Perhaps one day I’ll have the opportunity to see him again, though I can only hope it’s at his true home: the Portola Palace in Lhasa, Tibet. DID YOU KNOW: Though people often write His Holiness’ name as Dali Lama or Dalia Lama, the correct spelling is DALAI Lama. Tourists are invited to join the monks during their study and debate sessions. The Tibetan National Martyrs’ Memorial – located outside the Tibet Museum … just behind the Dalai Lama’s compound.